Home abandoned building industrial hygiene power plant Abandoned industrial buildings are cool. Abandoned industrial buildings are cool. Something about abandoned industrial buildings captures my interest. Maybe its because they used to serve an important purpose, and now they just take up space and rust away. Maybe its because they serve as a record of older technology, and the wanna-be archaeologist/anthropologist/engineer in me wants to figure out how the machine worked and why they switched to new technology. 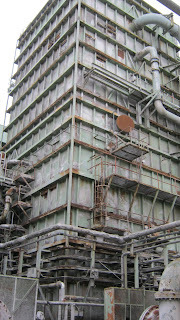 Either way, these old scrubbers are abandoned in place, and they're tall and imposing. Part of me wanted to get closer, climb inside, and check it out. The wise/obedient part of me decided that the pictures would have to be enough. I didn't feel like risking tetanus (dirt + rust), histoplasmosis (bird poop), spider bites, cuts from sharp edges of equipment, or disciplinary action from the client. 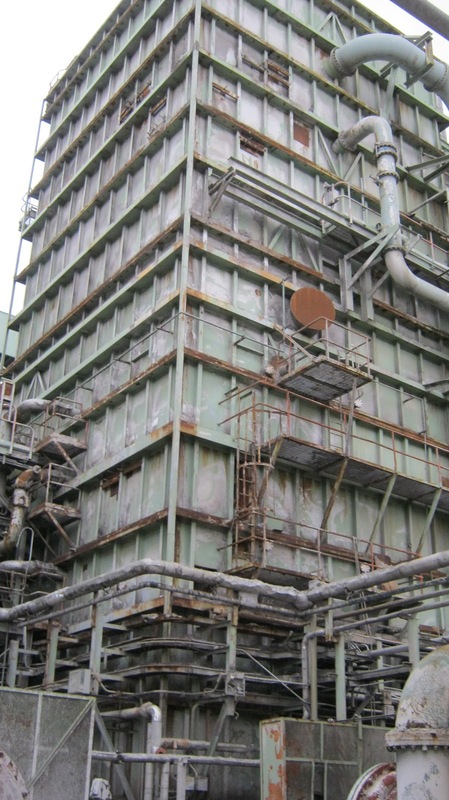 But I can't get over how cool the derelict scrubbers were.